Duc de Richelieu (Armand Emmanuel de Sophia-Septimania Vinero du Plessis, not to be confused with Cardinal Richelieu, his praprapradyadya) - French and Russian statesman. 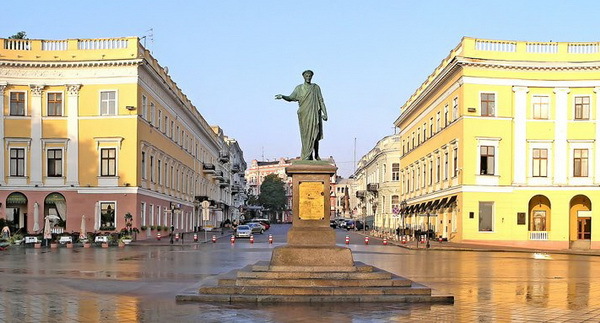 One of the early mayors of Odessa, has done much to develop the city. The monument was built thankful Odessites in 1828 and now, thanks to its uniqueness and beauty of the whole ensemble (itself a monument, Primorsky Boulevard, two "tsirkulnyh" House and Potemkin Stairs) - the card of the city.